Six months out of the year, my family leads a relatively healthy existence, especially when it comes to our diets. Fruit with breakfast, salad and other greens with dinner, an apple that may travel to and from school a few times in a lunch bag, but at least it makes the trip with a possibility of being eaten. But every fall, a certain day comes along to mess up all my stringent menu planning. Starting on October 31, and gaining momentum through Christmas candy, Valentine’s chocolate, and Easter basket jellybeans: It’s time to kick off my annual six-month war against sugar, starting with the dreaded trick-or-treating haul. To make matters worse, we live in a neighborhood noted for its generous Halloween handouts. And nobody goes as pedestrian as Smarties. It’s mostly all chocolate, all the time, maybe with a few Skittles and Starburst thrown in. When I was growing up, we all knew exactly which house in the neighborhood handed out full-size candy bars on Halloween; my kids and their friends may have several of those generous homes to choose from. By 8 p.m. on Halloween night, my children have enough candy to last them at least until some Hershey’s kisses show up in their Christmas stocking to replenish their supply all over again. Most years I confiscate their stashes, but they always seem to have another supply. I’ve found candy wrappers in every conceivable place: between sofa cushions, lining the bottom of their backpacks, inside pillowcases on their beds. I beg the kids to remember that sugar is poison and suggest that they increase their tooth-brushing to three times a day. Naturally, it is a losing battle. They are middle-school kids with a large ransom of candy. There is no way out until it’s all used up. Some parents feel the same way that I do, and are investigating non-candy trick-or-treat handouts, like stickers or non-permanent tattoos. I’d love some sugarless gum at this point. But other parents think I’m making too big a thing out of it. In fact, dietitian Cara Rosenbloom recently wrote an editorial in The Washington Post about how parents should calm down about Halloween candy. 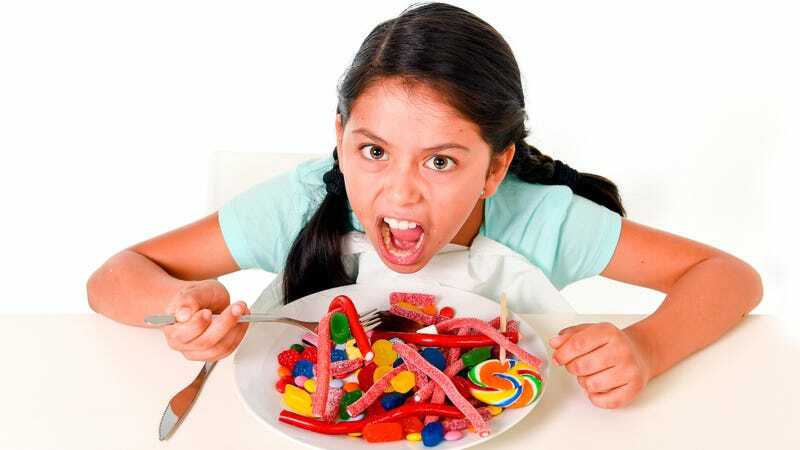 “Studies show that children who have regular access to candy and treats tend to eat them moderately, while children who recognize them as forbidden foods tend to load up when available, even if they aren’t hungry.” Sounds painfully familiar. Rosenbloom maintains: “I don’t want candy and chocolate to be marred by guilt and shame. Halloween should not be about replacing caramels with stickers. Instead, every day should be about parents acting as role models to teach children to develop a healthy relationship with food.” Well, sure, in a perfect parenting world. That would also belie my own occasional Ben & Jerry’s binges; if I don’t feel like I can trust myself around all that sugar, why should my kids? Maybe if Halloween was just one day to get through. But it isn’t. My kids’ trick-or-treat booty can last several weeks, infesting our house with a substance that I almost never allow. We are not a family with a constantly full cookie jar or a bottomless ice cream freezer. For me, not having sugar around just makes it less likely that I’ll actually eat it. For the kids, that apparently makes them want it more. Where’s the happy medium for all of us? So I sat down with the kids to talk about all of our relationships with candy. First, I asked them what their favorite food was, and was surprised when my daughter responded with spaghetti and meatballs and my son opted for Asian food, like his dad’s Panang curry. They agreed that they would. “And then the candy,” said my daughter. Still, the problem remained: What was a reasonable plan for all of that candy? Would they let me be the candykeeper so we could dole their stash out at reasonable amounts? “Mom,” said my son. “I would like you to hide it from me like you did with my other candy.” My daughter was a bit more resistant, but we agreed on a daily serving of two candies apiece. I pointed out that the stash will last longer that way too, instead of being depleted by mindless TV-watching sugar binges. Eating only when hungry and stopping when full sounds like a good message for all of us—especially as Thanksgiving now approaches. Update, November 1: Here’s last night’s haul, just so you guys know what I’m up against. Hope you all had a great Halloween!